Q. How do I get a card? Q. How do I find out what discounts are currently available? Q. How long is my discount card valid for? Q. How do I get my business listed? Q. Why should I advertise with you? A. You can get a card several different ways. For full details click here! A. That's the easy part! Simply check the website at any time and find a spot in your neighborhood. 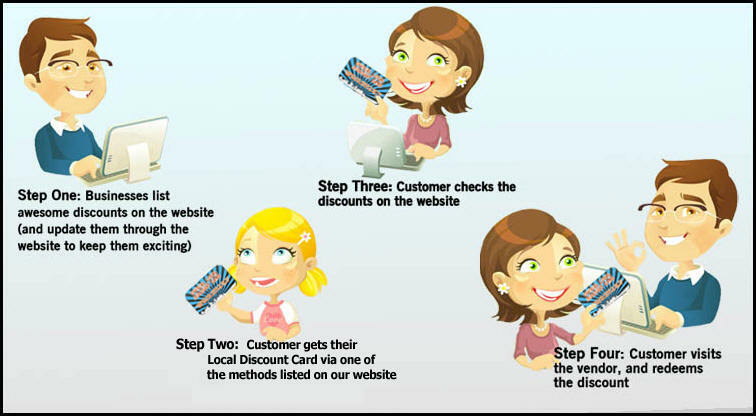 When you visit the business, show them your card and they'll give you the discount listed on the website. A. We are constantly adding new businesses to our website. Be sure to check back often to see the discounts that are currently available. You can view the discounts by category, or view all of the currently offered discounts at once on our Discount Page. You can also browse to our website on your Internet Enabled Mobile Phone and you will automatically be redirected to our "Mobile Website", where you can browse all of the latest discounts right on your Cell Phone! A. It's easy to get your business listed on our website and to start accepting our Discount Card right away! For more information about advertising with us, please click here! A. You'll be shocked how affordable it is to advertise with us! Click Here for more information and our current rates. Affordability - While other websites, coupon books, & print advertising can stretch your advertising budget, we offer the most interactive advertising in town, while not charging you an arm and a leg! Interactive - Cardholders will be constantly checking the website to see what new discounts are being offered. Exposure - Your company information will be viewed by 1000's of potential customers every month! We are distributing Discount Cards by the 1000's as well....and each Cardholder will come here to view the current discounts. They see your business when they do! Strong ROI - Card holders will continually visit our website to find new offers and updates. This gives you the opportunity to reach 1,000’s of customers for pennies per day. In addition, supporters of our local youth organizations, will want to buy from businesses that have shown support for their organization. Make A Difference - Local youth organizations are in constant need of funds to carry out their respective missions. Imagine the impact that you and your business can have upon the lives of our youth and the missions that they serve.